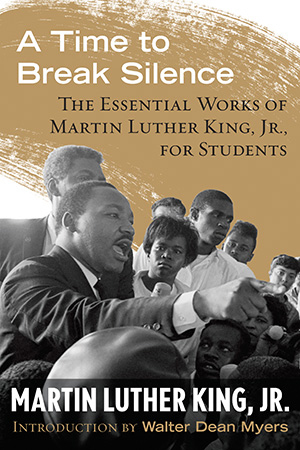 A Time to Break Silence presents the Reverend Dr. Martin Luther King, Jr.’s most important writings and speeches-carefully selected by teachers across a variety of disciplines in an accessible and user-friendly volume for students. Arranged thematically in six parts, the collection includes eighteen selections and is introduced by award-winning author Walter Dean Myers. Included are some of Dr. King’s most well-known and frequently taught classic works, like “Letter from Birmingham Jail” and “I Have a Dream,” as well as lesser-known pieces such as “The Sword that Heals” and “What Is Your Life’s Blueprint?,” which speak to issues young people face today. Faced with diminishing adult support for protests in Birmingham, in 1963 Dr. King turned to the city’s young people. James Bevel of the Southern Christian Leadership Conference (SCLC) suggested recruiting local students to participate, reasoning that since they did not have jobs to lose, they would be more willing to risk arrest. After being trained in the principles of nonviolence, more than one thousand African American students skipped their classes on May 2 and gathered in downtown Birmingham, marching directly into police lines to demand desegregation of local businesses, public facilities and restaurants. While hundreds were arrested and jailed, many more young people returned the next day to take their places. In the ensuing confrontation, T. Eugene “Bull” Connor, Birmingham’s commissioner of public safety, ordered fire hoses and police dogs to be unleashed on the unarmed protestors. Here, Dr. King recounts the “Children’s Crusade” and other important events that led to the end of segregation in Birmingham. After eight days of imprisonment, Ralph Abernathy and I accepted bond to come out of jail for two purposes. It was necessary for me to regain communication with the S.C.L.C. officers and our lawyers in order to map the strategy for the contempt cases that would be coming up shortly in the circuit court. Also, I had decided to put into operation a new phase of our campaign, which I felt would speed victory. I called my staff together and repeated a conviction I had been voicing ever since the campaign began. If our drive was to be successful, we must involve the students of the community. In most of the recent direct-action crusades, it had been the young people who sparked the movement. But in Birmingham, of the first four or five hundred people who had submitted themselves to arrest, two-thirds had been adults. We had considered this a good thing at the time, for a really effective campaign incorporates a cross section of the community. But now it was time to enlist the young people in larger numbers. Even though we realized that involving teenagers and high-school students would bring down upon us a heavy fire of criticism, we felt that we needed this dramatic new dimension. Our people were demonstrating daily and going to jail in numbers, but we were still beating our heads against the brick wall of the city officials’ stubborn resolve to maintain the status quo. Our fight, if won, would benefit people of all ages. But most of all we were inspired with a desire to give to our young a true sense of their own stake in freedom and justice. We believed they would have the courage to respond to our call. James Bevel, Andy Young, Bernard Lee and Dorothy Cotton began visiting colleges and high schools in the area. They invited students to attend after-school meetings at churches. The word spread fast, and the response from Birmingham’s youngsters exceeded our fondest dreams. By the fifties and by the hundreds, these youngsters attended mass meetings and training sessions. They listened eagerly as we talked of bringing freedom to Birmingham, not in some distant time, but right now. We taught them the philosophy of nonviolence. We challenged them to bring their exuberance, their youthful creativity, into the disciplined dedication of the movement. We found them eager to belong, hungry for participation in a significant social effort. Looking back, it is clear that the introduction of Birmingham’s children into the campaign was one of the wisest moves we made. It brought a new impact to the crusade, and the impetus that we needed to win the struggle. The child looked into his eyes, unafraid, and gave her answer. She could not even pronounce the word, but no Gabriel trumpet could have sounded a truer note. Even children too young to march requested and earned a place in our ranks. Once when we sent out a call for volunteers, six tiny youngsters responded. Andy Young told them that they were not old enough to go to jail but that they could go to the library. “You won’t get arrested there,” he said, “but you might learn something.” So these six small children marched off to the building in the white district, where, up to two weeks before, they would have been turned away at the door. Shyly but doggedly, they went to the children’s room and sat down, and soon they were lost in their books. In their own way, they had struck a blow, for freedom. The children understood the stakes they were fighting for. I think of one teenage boy whose father’s devotion to the movement turned sour when he learned that his son had pledged himself to become a demonstrator. The father forbade his son to participate. “Daddy,” the boy said, “I don’t want to disobey you, but I have made my pledge. If you try to keep me home, I will sneak off. If you think I deserve to be punished for that, I’ll just have to take the punishment. For, you see, I’m not doing this only because I want to be free. I’m doing it also because I want freedom for you and Mama, and I want it to come before you die.” That father thought again, and gave his son his blessing. The movement was blessed by the fire and excitement brought to it by young people such as these. And when Birmingham youngsters joined the march in numbers, an historic thing happened. For the first time in the civil-rights movement, we were able to put into effect the Gandhian principle: “Fill up the jails.” Jim Bevel had the inspiration of setting a “D” Day, when the students would go to jail in historic numbers. When that day arrived, young people converged on the Sixteenth Street Baptist Church in wave after wave. Altogether on “D” Day, May 2, more than a thousand young people demonstrated and went to jail. At one school, the principal gave orders to lock the gates to keep the students in. The youngsters climbed over the gates and ran toward freedom. The assistant superintendent of schools threatened them with expulsion, and still they came, day after day. At the height of the campaign, by conservative estimates, there were 2,500 demonstrators in jail at one time, a large proportion of them young people. Serious as they were about what they were doing, these teenagers had that marvelous humor that arms the unarmed in the face of danger. Under their leaders, they took delight in confusing the police. A small decoy group would gather at one exit of the church, bringing policemen streaming in cars and on motorcycles. Before the officers knew what was happening, other groups, by the scores, would pour out of other exits and move, two by two, toward our goal in the downtown section. Many arrived at their destination before the police could confront and arrest them. They sang as they marched and as they were loaded into the paddy wagons. The police ran out of paddy wagons and had to press sheriff’s cars and school buses into service. Watching those youngsters in Birmingham, I could not help remembering an episode in Montgomery during the bus boycott. Someone had asked an elderly woman why she was involved in our struggle. “I’m doing it for my children and for my grandchildren,” she had replied. Seven years later, the children and grandchildren were doing it for themselves. What Is Your Lifeís Blueprint? * Reflection questions are included after each selection. Teachers Guide and companion curriculum developed by the Martin Luther King, Jr. Research and Education Institute at Stanford University available online through www.thekinglegacy.org/teachers.